Welcome. I moved to Nashville in 2001, and have be blessed to make some wonderful friends. After moving from a house in Florida, to an apartment in Nashville, I missed being able to entertain groups of friends simply due to lack of space. When I finally decided to make Nashville my home and buy a house here, I wanted a space that friends to gather and socialize in a relaxed and friendly atmosphere. The basement in my new house, which opens into the back yard made the perfect space, so JohnMichael's Pub was born. I have made a couple of trips to Ireland since moving to Nashville and loved the atmosphere of the pubs there. So I made my pub to resemble an Irish style pub to give the atmosphere of a local community pubs in Ireland, but of course it is not a true "Pub" (Public house) since it private place for my friends to gather. 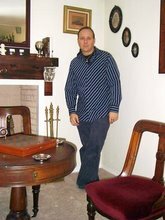 I plan to use this blog to post thoughts, ideas, recipes and a variety of other things related to my pub and the parties held there. If you see anything here that interests you, feel free to email me. I have a great group of friends that is very diverse, but I am always open to making new friends. Day 12- Further into the highlands. Ferry Inn, the house we are staying at is on a peninsula at the edge of the highlands. Some of the pictures you have seen were from the highland area just north of here, such as the hiking photos. Today we visited the highland town of Inveraray. The castle shown here is the family home of the Duke of Argile, who is married to the heiress to the Cadbury fortune (yes the Cadbury Candy eggs people). The castle was built in 1745 on the ruins of a 15th century castle. The towers were added in the late 1800's. This second photo shows a good view of the entire castle. The photo below it is of the highland cattle in a field near the castle. Notice they have longer hair than than our American breeds. ruin of Kilchurn Castle, built in the mid 1400's. The castle was abandoned in the 18th century after it was struck by lightning. It sits right on Loch Awe, which is the largest fresh water loch in Scotland, streaching 25 miles. Behind the castle is Ben Cruachan, a mountain that almost 3,700 feet. No pictures to post. We just went into Helensburg, had lunch, did a little grocery shopping and posted a couple of birthday cards. Nothing much else to report. We just took a day to relax. This morning started with mass at St. Michael's and All Angel's Scottish Episcopal Church in Helenburgh. It is a beautiful Church, built in 1843. The people were very warm and welcoming when we arrived. I spotted a woman wearing a Third Order, Society of St. Francis Cross (my order) and identified myself by showing her my profession cross. She then introduced us to others. There are six Franciscan's (TSSF) in the parish. After services we were invited for lunch in the parish hall. They were having a soup, cheese and bread lunch to benefit "Christian Aid UK." The food was wonderful and the people were very nice. They sat with us, talked, asked questions and showed a sincere interest. It was a wonderful experience. This picture is the front of the sanctuary area. Scottish barley (golden promise and chariot varieties) and yeast are the only ingredients in the spirits they distill before barreling it for ageing. The barley is sprouted and air dried without the use of peat, hence the Scotch they produce is described as unpeated. The distillery has been in operation since 1833 legally, although it is said to have been in operation before that. Changes in the law allowed it to become legal in 1833. Matthew and I were able to tour the distillery to see the whiskey being made and taste their 10, 17, and 21 year old single malt scotch whiskey's today. We both agree the 17 year old was the best. Some critics seem to agree. It was awarded the Gold Medal by Scotland's Master Blenders in the prestigious International Spirits Challenge 1999 and again in 2005. It was named "Best of the Best" in the Highland Malt Whisky category by Whisky Magazine in 2001. It also received the Double Gold in the San Francisco World Spirits Competition in 2003 and took honors in 2005 and 2007. This photo shows the copper stills used to distill the spirits used to make Glengoyne's whiskeys. Imagine my excitement when we drove into Glasgow this morning and one of the first sites I saw was a blue police call box. After all, David Tennant, the 10th Doctor in the Dr. Who television series did grow up just outside of Glasgow. What better place for the Doctor to have parked his T.A.R.D.I.S. But alas, I knocked on the door and not Doctor, no David Tennant, no one. Just a police call box, but how much fun to get Matthew to take my picture next to it with me wearing my shirt with a picture of a TARDIS on the front with the caption "You never forget your first Doctor." From there we walked a few blocks to what is called the Glasgow Cathedral, although it is now a Church of Scotland (Presbyterian) Church, which technically does not have cathedrals. It was built in the 13th century and is one of only a few to escape destruction during the Scottish reformation. It is built on the original site of the chapel built by the city's founder St. Mungo in the 6th St. Mungo's remains are in below the alter shown in this picture. The alter is one level below the ground level of the church, under the location of the original high alter for the Church. We also visited Provand's Lordship, the oldest surviving house in Glasgow, built in 1471. In 1566 century, Mary, Queen of Scots stayed here with her husband Lord Darneley while he recuperated from a serious illness. We also stumbled into one of the halls for Strathclyde University that we thought was a church (originally was a church). The room was set for students to take their exams. Matthew commented that it looked like a sceen from Harry Potter (it looked like the hall at Hogworths). From there we went to the Barras, the open air market (flea market in US terms) in downtown, the called it a day. Glasgow had so much more than we expected to find. Today we went hiking in the mountains. We went to Arrochar and climbed a mountain called "The cobbler's wife." The photo to the left shows the cobbler (Ben Aurthur) on the left of the photo. The cobbler's wife is to the right of this. It's true height is not shown. It is close to 3000 feet. We did not make it quite to the top, but as you can see by the scenery below, we made it pretty far and had a beautiful view and had our lunch near the top. This picture of Matthew shows how steep of a climb we had. It was steep ALL THE WAY up. Below is a photo (left) of me with the Cobbler over my right shoulder. The picture below (right) is me with the Loch and other mountains behind me. The picture above is a closeup of a field of blue bells on the side of the mountain. On Thursday we stayed close to home and just did a little shopping in the nearby town of Helensburgh, since we were a little tired from our journey to Iona and back. I thought this would be a great time to tell you about where I am staying and to publicly thank Joe and Diane Brown for the hospitality in allowing me the use of their vacation home in Scotland. I am here with my friend Matthew. Joe and Diane are his Stepfather and his mother. The home is called The Ferry Inn. It was built in 1896 by the 4th daughter of Queen Victoria, HRH Princess Louise. Princess Louise was married to the Marquis of Lorne, the Duke of Argile who later became Chief of Clan Campbell. The architect of the home, Sir Edwin Lutyens, is one of Scotland's most famous architects. The home sits on the water where the firth of Clyde meets L och Gare on the Rosneath Peninsula. The photo on the left is the view of the house from the beach. The house has three levels. The photo on right (below) shows Mathew relaxing on the balcony over looking the water. We have enjoyed sitting on the balcony and discussing the days events and planning the next day. The photo on the right is just part of the view from the balcony where he is sitting. Helensburgh, where we shopped today, is the town across the loch. On Monday morning we set out for two nights on the isle of Iona. The Isle of Iona is famous as the site St. Columba settled in 563 when he left Ireland. It is from this site he Christianized what is now Scotland. It took us three ferries to reach the island. This is a photo of me on one of those three ferries. The photo beside it is of the entrance to the Abby. To find out more about the Abby and chapel (St Oran's) Click this link http://http://www.scotshistoryonline.co.uk/oran.html. The island was home to five high crosses. The one in this photo is the cross of St Martin. It is from the 8th century and is the only cross still in tact in its original location. Other than the religious community on the island, the island is home to a small village. There are only about 100 full time residents on the island and it is very peaceful and still retains its natural beauty as shown in this photo below. It is not truly possible to show its true beauty in a photo, but I do have others I can share when I return home. On day three of out trip, we drove back to Edinburgh. This first picture is of St Giles on the Royal mile. Inside the cathedral is the chapel used by the order of the thistle. This is a picture of me in front of the Castle at Edinburgh, (Right) and me at the gates of Holyrood palace, the Queens Scottish home (below). the shaft of an extinct volcano. Most of the mountain is long eroded away, leaving the very sold shaft that is solidified magma. The photo below is of me on the castle wall. Below is another photo from the castle showing the city below. The grouse (yellow flowers) are in full bloom all over Scotland at the moment. As those of you who know me know, right after the Mayday festivities, I took off for Scotland. I thought I would chronicle the journey a bit with a pic and comment or two every day or so of my trip. Friday, my first day in Scotland was consumed with the drive from Edinburgh to the house at which I am staying just outside of Helensburg, with a stop for groceries and other essentials along the way. Here is a pic of me sampling a bit of Scotch on the balcony of the house over looking the firth of Clyde. After my prior post on mayday, I wanted to post a followup pic of the maypole festivities. I was so wrapped up in the maypole dance I forgot to get someone to take pictures with my camera. Fortunantly, one of my guest who did not dance took this with his cell phone. At this point, the ribbons we down far enough on the pole that it was begining to be a challenge for some of the taller members of the group. I would like to thank Ed for drumming along with us as we danced, and all who participated and attended. Mayday is quickly approaching, and since I have not posted here in a while, I thought I would post a little about this holiday. Those who know me know I have a Mayday celebration in my back yard each year. It is a simple cookout followed by participating in some traditional mayday activities such as the ribbon dance around the maypole that is a permanent fixture in my back yard and leaping over the mayday fire. Of all of the “rites of spring” the Maypole seems to be one of the most widely known. Trees represent the vitality and fertility of nature. What better symbol to represent the height of Spring and the bursting forth of new life in the world. The tradition of the maypole dates back to pre roman times in Europe. The tradition was to bring a young tree from the forest and remove all of the branches except those on the top. The adornment with flowers is a roman influence from the festival of Flora. The tradition of the maypole may have originally be a Germanic tradition, it spread to most of Europe by the late middle ages. By the 16th century the maypole was a community symbol in many towns in the British Isles. Many larger towns and cities began to erect permanent maypoles. Puritan influences attempted to wipe out the maypole tradition in England in the mid 1600’s, but the traditions flourished under the rule of the Stuarts. 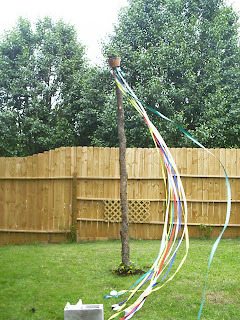 The traditional dance entails ribbons attached to the top of the maypole being held by two circles of dancers (one inside the other) going opposite directions and weaving the ribbons over and under each other as the two circles of dancers weave in between each other, wrapping the pole in colourful ribbons. The pole may also be adorned in flowers and greenery. A slightly lesser known tradition associated with Mayday is the tradition of fire. In Celtic regions like Ireland, Scotland, the Isle of Mann and even Wales the may fire was the central tradition. In old Irish Mayday was Beltene, which meant “bright fire” (now called Beltane). In these regions, the lighting of the community fire was the central tradition. They fire was the symbolic rekindling of the earth after the winter. In Highland areas, there was a tradition of eating custard made from eggs and milk and making cakes of oatmeal (bannoks) which were toasted in the embers of the fire (I have posted a recipe below you can make in the oven or on the griddle). There was also a tradition of leaping over the flame. This has emerged into a tradition of leaping over the Beltane fire to bring good fortune in the coming year. There is a very large festive held in Edinburgh, Scotland each year on the night of April 30th called the Beltane Fire Festival that draws about 12 thousand people. Another minor tradition is May wine. This also was originally a German tradition. It is simply a sweet new white wine infused with sweet woodruff. The steeping of the woodruff in the wine creates an aromatized wine that celebrates the freshness of spring. In German, it is known as Maiwein. An adaptation of this is the Maibowle (May bowl) in which strawberries and other fruits, and perhaps some sparkling wine may be added to a bowl of the wine to create a punch. I should note here that in large doses Woodruff is toxic due to its coumarin content. It has been banned as an herbal remedy by the FDA, but is specifically cleared for use as an additive to wine when properly prepared (about 1 oz to 750ml of wine –strain it out before serving the wine). Here is the bannoks recipe that I use. It is a slightly modified from the traditional version toasted in the mayday fire, but, I think, tastes just as good and honors the tradition. Combine flour, oats, sugar, baking powder, and salt in large bowl. Add butter. Mix with a spoon until mixture is blended and crumbly. Slowly stir in enough milk to make smooth but firm dough. Turn dough out on to lightly floured board and knead until dough hold together. Roll dough 1/3" thick. Cut into 2-1/2" rounds and place on an ungreased cookie sheet about 2" apart. Bake 12-15 minutes or until light brown. It has been a while since I posted to this blog. The winter was busy, but I am ready for spring. The St. Paddy’s day and May day gatherings are in the planning stages, and the seedlings are sprouting in the greenhouse and should be ready for spring planting. While hibernating this winter and watching reruns of Torchwood in anticipation of the new season, I ran across an interesting website, timetravelfund.com. For just $10 you can join the fund. Eight dollars goes to provide you with an “official” certificate stating you are a member of the fund and to maintain the member database. One dollar goes into an account to make sure future legal fees are covered and one dollar goes to an investment account to accrue interest for the next five hundred years or so to finance retrieving members of the fund and bringing them to the future and to provide for the members needs in the future. The two assumptions that drive this plan is that 1) time travel will be possible in the future. 2) The current financial systems will be in place. As the website points out, $1 invested at 5% for 500 years will grow to $39,323,261,827.22. Hopefully, Thirty-nine billion dollars will still be worth something 500 years from now. I know this may seem far-fetched, but as the website states, it is only $10. It is worth it just to have the certificate. It will make an interesting conversation piece hanging on the wall in Johnmichael’s Pub, and if I make it to the future, very cool. Since watching the original Dr. Who episodes as a child, I have wanted to be a “Time Lord” and travel through space and time, but that is the appeal of the show I guess. If there is a one in thirty-nine billion chance of this happening, I guess it is worth $10 to find out. Check out the site, and who knows, we may see each other in the 26th century. JohnMichael's pub is a private "Irish" pub in the basement of JohnMichael's home. It serves as venue for five or six parties a year gathering JohnMichael's friends.